As you can see, I’m not exactly a “leggings” person. However, everybody seems to be wearing them so I thought I’d give them a try. I bought a funky black and white pair during the summer in Lunenburg. I have yet to find something to wear with them! I’ve tried printed fabrics, and solids, but the prints just don’t work with the stripes. 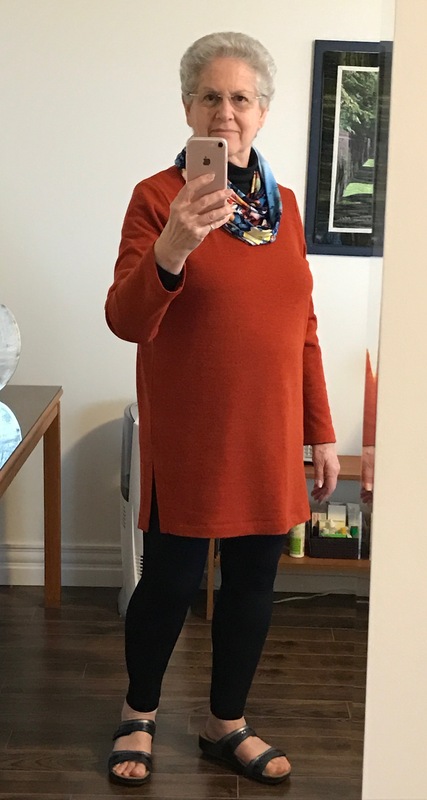 I made both a black and navy pair from some lovely stretch knit I bought from Distinctive Sewing Supplies, they both fit fine but same problem – nothing to wear with them that looks reasonable. I disagree! You absolutely can wear leggings.